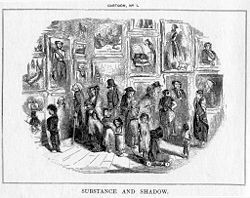 "Cartoon no.1: Substance and Shadow," an illustration by John Leech that satirizes the preparatory cartoons for frescoes in the new Palace of Westminster (1843), and which created the modern meaning of the word "cartoon"
A cartoon is a form of expression, or communication, that refers to several forms of art, including humorous captioned illustrations, satirical political drawings, and animated film. Originally, the term referred to full-scale drawings for various forms of fine art, such as frescoes and tapestries. From the mid-nineteenth century it acquired the meaning of a pictorial parody, humorous and often satirical in its portrayal of social and political events. Magazines such as Punch and The New Yorker, popularized this visual form of joke, which has continued to be used with great effect on society. Providing the most incisive commentary on matters of current concern, the editorial cartoon in particular has been instrumental in monitoring and impacting the social and political lives of those in positions of power and influence. Animated cartoons cater more to younger audiences, entertaining children with the adventures of anthropomorphized animals, superheroes, and child protagonists. 1 History of the Term "Cartoon"
From fine art to political commentary and entertainment, cartoons have played an important role in shaping the world as we know it. History of the Term "Cartoon"
In its original meaning, a cartoon (from the Italian cartone, meaning "big paper") is a full-size drawing made on paper as a full size study for artwork. Cartoons were first used during the sixteenth century for fresco painting, a technique involving the application of pigment to a wet lime plaster wall. Once the composition was drawn on paper, it was then transferred to the plaster wall by one of two techniques. The artist might use a tool to trace over the design, indenting the image into the plaster, or a perforating tool might be used, after which charcoal dust was applied to mark the lines of the composition. 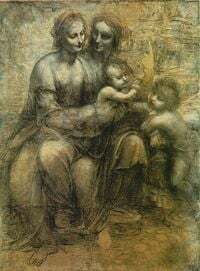 Cartoons by painters such as Raphael and Leonardo da Vinci continue to be displayed proudly in museums around the world. A world-renowned collection of cartoons for tapestries by Peter Paul Rubens, one of the most famous artists of the seventeenth century, is displayed in the John and Mable Ringling Museum of Art in Sarasota, Florida. It was not until 1843 that the term "cartoon" was used to refer to anything but preliminary sketches for fine art. The modern use of the term was coined by the British magazine Punch, well known for its satirical drawings. At the time, the Houses of Parliament were being rebuilt after a fire, and artists were encouraged to submit preliminary drawings, or cartoons, to help select new paintings and murals. A series of drawings given the title "cartoons" (including John Leech's "Cartoon, No.1: Substance and Shadow") used sarcasm to attack the government's expenditure of money on needless opulence while the poor went hungry. The term "cartoon" stuck as a description of pictorial satire. In time, the term came to be used in reference to any form of humorous drawing, and, in the early twentieth century, to animated drawings. An editorial cartoon, also known as a political cartoon, is an illustration or “comic strip" containing a political or social message. Editorial cartoons first made an emergence during the Protestant Reformation in Germany in the early 1500s. In order to disseminate his ideas to a largely illiterate population, Martin Luther, the leader of the Reformation, turned to the printed image. Images protesting the actions of the powerful Catholic Church were distributed on broadsheet posters and illustrated pamphlets, and proved an effective means of reaching a large portion of the population. In the United States, the first political cartoon was printed by Benjamin Franklin in The Pennsylvania Gazette on May 9, 1754. 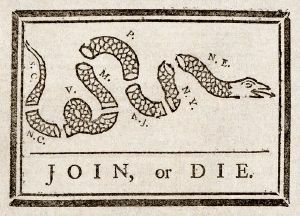 This well known image features a segmented snake, where the segments represent colonial governments, and the caption "Join, or Die" below. Based on the popular superstition that a severed snake could be made whole again if the pieces were placed together, the cartoon urged colonial governments to unite during the French and Indian War. The image was reprinted by newspapers throughout the colonies. This confrontation is credited by consensus with establishing once and forever a fledgling craft … as an enduring presence in American political culture. In its telling is exemplified those salient themes dear to the collective scholarship of the medium, such as it is—the power of the giants of the genre to fuse creative caricature, clever situational transpositions, and honest indignation to arouse the populace and alter for the better the course of human events: the ethical imperative that lifts transitory journalism into transcending art. Modern editorial cartoons can be found in most newspapers, and many radical or minority issue editorial cartoonists also have established a presence on the internet. Editorial cartoons can be very diverse, but a certain established style exists. Most editorial cartoons use visual metaphors and caricatures to explain complicated political situations, summing up a current event with a humorous or emotional picture. Some common visual metaphors are the donkey and elephant (symbolizing American political parties), the beaver (symbolizing Canada), the lion (symbolizing Great Britain), and the bear (symbolizing Russia). Although their style, technique, or viewpoints may vary, editorial cartoonists all draw attention to current social and political issues. Because cartoon images condense meaning through metaphor, allusion, and metonymy, they create new worlds of understanding—a President becomes a tiger (or pussycat), a political campaign is described as a sinking ship, a televangelist sell snake old. … It is the dramatistic creation of such understandings that forms the rhetorical core of many visual images, including political cartoons. Editorial cartoonists, however, are not supposed to be government propagandists; that is the job of other people. Cartoonists are supposed to keep a jaundiced eye on the democracy and those threatening it, whether the threats come from outside or inside the country. While such cartoons can often be a positive influence for change, they can also exacerbate existing tensions. In extreme cases, editorial cartoons have caused world-wide protests and violence, such as the case of the 2005 publication of caricatures of the Muslim prophet Muhammad in a Danish newspaper. Modern "gag cartoons" are found in magazines, newspapers, and greeting cards, and generally consist of a single drawing with either a caption immediately beneath or a "speech balloon." Well-known gag cartoonists include James Thurber, Gary Larson, and Peter Arno. "Comic strips," also known as "strip cartoons" in the United Kingdom, are found daily on their own page in newspapers worldwide, and are usually a short series of cartoon illustrations in sequence. In the United States they are commonly referred to as "comics" or "funnies." Although humor is the most prevalent subject matter, adventure and drama are also represented in this medium. Most comic strips are stand-alone, but some are serial in nature, with a story line that is continued daily or weekly. A noteworthy comic strip cartoonist was Charles Schulz who created the Peanuts cartoons. An animated cartoon horse, drawn by rotoscoping from Eadweard Muybridge's nineteenth century photos. One of the most common modern usages of the phrase "cartoon" refers to animated television, movies, and short films. Although the term can be applied to any animated presentation, it is most often used in reference to programs for children, featuring anthropomorphized animals, superheroes, the adventures of child protagonists, and other similar themes. Winsor McCay, considered "the father of the animated cartoon," produced a landmark animated cartoon in 1914 titled Gertie the Dinosaur. This cartoon was the first to feature a character developed specifically for animation, and showed the true potential of the medium. Legendary animation director Chuck Jones is quoted as saying that "the two most important people in animation are Winsor McCay and Walt Disney, and I'm not sure which should go first." Five years later, Otto Messmer created the world famous Felix the Cat, who appeared in a series of cartoons. One of the most famous early cartoons, and the first to incorporate synchronized sound, is Walt Disney's Steamboat Willie. Released in 1928, this was the first feature performance of Mickey Mouse. Disney went on to create an animation empire, encouraging his animators to portray characters with more realistic movement, and creating breakthrough masterpieces like Snow White and Fantasia. In 1930, Looney Tunes was founded by Disney animators Hugh Harman and Rudy Ising (both of whom left three years later to form the MGM cartoon studio). Directors Tex Avery and Bob Clampett began the cartoon tradition of exaggerated slapstick comedy that has persisted until today. Characters like Bugs Bunny and Daffy Duck exemplified not only the talent of individual animators, but also their ability to collaborate in a studio-based, assembly-line type system. Until the late 1940s, cartoons were shown in movie theaters. It was typical for theaters of the day to show two full-length films separated by a cartoon and newsreel; many "golden era" cartoons from the 1930s through the 1950s were originally designed to be seen on the big screen. Once television started to grow in popularity, cartoons began to be produced for the small screen. Disney was one of the first cartoon studios to regularly air cartoons, including them in live action programs like The Mickey Mouse Club. In the 1950s, United Productions of America (UPA), a studio formed by ex-Disney animators, created a simple, less theatrical approach to animation. Instead of natural colors and detailed background, the UPA animators used bold colors, abstract renditions of clouds and trees, and limited movement. As more cartoons were produced exclusively for television, other animators adopted the time and money saving techniques of the UPA animators, though many lost UPA's aesthetics in the process. Two of the most popular and longest running cartoon shows are The Flintstones, which premiered in 1960, and The Simpsons, which premiered in 1989. Cartoons continue to have success as full length movies; modern techniques in computer animation allow the cartoonist to create images that would not be possible with traditional animating processes. Movies like Toy Story (1995) and Finding Nemo (2003) are examples of computer-generated imagery, or CGI. The use of CGI technology does not, contrary to what one might believe, mean less work for the animators. Toy Story, the first completely CGI-animated feature, took four years to complete; the same amount of time it took for Disney animators to complete Snow White and the Seven Dwarfs. Cartoons have long been the subject of controversy in the areas of merchandising and violence, particularly since the predominant audience of cartoons is children. In the 1980s, cartoons like Strawberry Shortcake and He-Man were created around existing products, for which the television programs were little more than extended commercials. There are also a growing number of adult-themed cartoon shows, usually referred to as "adult cartoons." Certain styles of animation, such as Japanese anime, are not generally referred to as "cartoons." ↑ History of the Cartoon. Punch Magazine. Retrieved November 28, 2006. ↑ Part I: A Brief History of Political Cartoons. The University of Virginia. Retrieved November 28, 2006. ↑ Stephen Hess and Milton Kaplan, The Ungentlemanly Art: A History of American Political Cartoons (New York, NY: MacMillan, 1975), 52. ↑ Roger A. Fischer, Them Damned Pictures: Explorations in American Cartoon Art (North Haven, CT: Archon Books, 1996. ISBN 0208022988). ↑ Janis L. Edwards, Political Cartoons in the 1988 Presidential Campaign. (London: Routledge, 1997, ISBN 0815328583). ↑ Chris Lamb, Drawn To Extremes: The Use And Abuse Of Editorial Cartoons (New York: Columbia University Press, 2004, ISBN 023113066X). ↑ John Canemaker, Background About Winsor McCay. Cartoonist Group. Retrieved November 29, 2006. excerpt from the book John Canemaker, Winsor McCay, His Life and Art. (New York, Abbeville Press, 1987), 211. ↑ Crandol, Animation History, Winsor McCay, Max Fleischer. Digital Media FX. Retrieved November 29, 2006. ↑ 9.0 9.1 Cartoons. The Museum of Broadcast Communications. Retrieved November 29, 2006. ↑ Young Minds Inspired, Animation. Academy of Motion Picture Arts and Sciences. www.oscars.org. Retrieved November 29, 2006. This page was last modified on 16 January 2017, at 17:35.